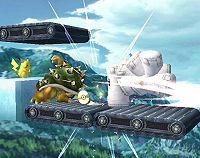 A CD Factory is a custom stage that is designed to assist in the collection of CDs and stickers in Super Smash Bros. Brawl. While the design of a CD Factory can be changed by the designer, it generally involves the use of conveyor belts running against one another to trap Sandbag and its contents. For a variety of reasons, CD Factories cannot exist in Super Smash Bros. 4, most prominently because Sandbag can no longer drop CDs. CDs were removed in Super Smash Bros. Ultimate. The idea behind a CD Factory involves setting all items to off with the exception of Sandbag. 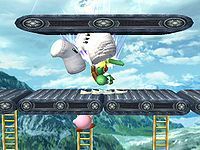 In doing so, Sandbag becomes the only item that spawns on the stage; hitting the item ordinarily causes it to release further items per its base behaviour, but as all other items are off, Sandbag is instead forced to drop stickers and CDs. The intent of the conveyor belts is to keep Sandbag in place as it is attacked, as well as to potentially corral other Sandbags into the area between the two belts. In addition to standard one-player variants, CD Factories can take on other forms, including forms intended for two or more players. The use of hacks can also allow players to make the conveyor belts move more quickly.